And keep more of the ones you already have. But your IVR isn't user-friendly enough to meet the expectations of today's impatient consumers. Conventional self-service gets a bad rap for frustrating customers. On the flip side, brand owners are fed up with poor self-service too, because they lose billions every year to poor service and customer defections. At Contact Solutions, we help you solve that problem with personalization technology that bridges the gap between what your customers expect, and the level of service your organization delivers. Unfortunately, most personalize self-service for the masses. Some even personalize the IVR with customer preference and other data. But what if you could measure, analyze, and dynamically adapt the customer experience to how specific callers actually behave in your IVR? That’s the appeal of Adaptive Personalization. It's a powerful combination of technology and analytics that measures how callers actually behave in your IVR. Then, it applies this intelligence to tailor the customer experience on the fly, for every caller, within every call, every time. And only Contact Solutions has it. In today's hyper-competitive economy, personalization is a critical success factor that marks a fundamental shift in how customers expect to be served. It allows IVRs to tailor customer calls, based on a customer's previous interaction history. For example, a personalized bank IVR would automatically push the “check my balance” option to the front of the call flow, because that’s the information you most frequently request. If your cable company had a personalized IVR, it would skip past the language option, and play all prompts in the language you prefer, based on the information in your customer profile. And if you called an airline's contact center from a noisy area, our personalization technology would sense that you’re struggling to hear the voice prompts, slow them down, and even offer agent assistance BEFORE you get frustrated and hang up. At Contact Solutions, our personalized IVRs use real-time data and sophisticated algorithms to speed up and slow down call flow based on how customers interact with the system. They also streamline customer care menus in real time, based on customer-specific preference and historical interaction data. In other words, our personalization technology makes customers feel like you’re willing to do whatever it takes to make it easier for them get the service they need. What could be more important than that? 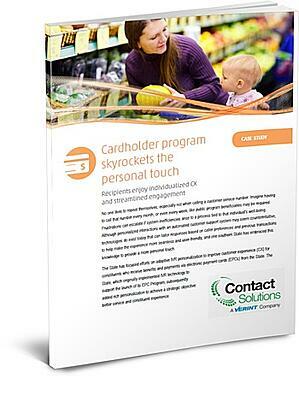 Download your free copy of the IVR Personalization Case Study.